A typical 1-cup serving of regular vanilla ice cream contains 14 grams of fat, 31 grams of carbohydrates -- most of which are sugar -- and only 4.6 grams of protein. 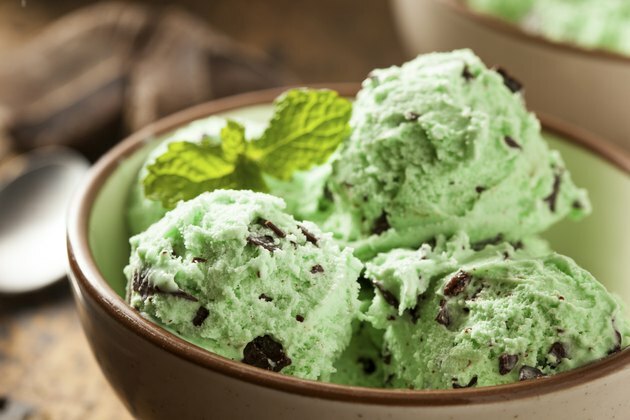 By using whey powder combined with other low-fat, low-sugar ingredients, however, you can have homemade ice cream with less than half of the fat and sugar and 23 or more grams of protein per serving. Although it's healthier, ice cream made with whey powder can still be high in calories, so enjoy it in moderation. The flavors of ice cream you can make with whey powder are limited only by your personal taste. Whey powder options range from unsweetened and flavorless to classics like vanilla, banana, chocolate and strawberry, to more exotic offerings such as marshmallow and peanut butter. Pick plain whey powder if you're concerned about your intake of artificial colors and flavorings and non-caloric sweeteners such as sucralose. Plan to use approximately 1/2 cup of whey powder to make two servings of ice cream, advises cookbook author and nutrition writer Anna Sward. Fruit adds body, natural sweetness and nutrition to homemade whey powder ice cream. Sward suggests using a frozen banana for a simple ice cream recipe that you can use as the basis for improvisation with alternate flavors of whey powder, but 1/4 to 1/2 cup of other frozen fruits such as berries or cherries are another option. If you prefer, substitute whatever fresh, ripe fruit you have on hand. Remove the peel, if necessary, and add it to the whey powder. To blend together the whey powder, fruit and any additional flavorings like sugar-free pudding mix or extracts, stir in low-fat cottage cheese, plain low-fat Greek yogurt, coconut milk, reduced-fat mascarpone or any combination of these. They'll add bulk and high-quality protein without too many extra calories or excessive fat, while giving the ice cream a creamy texture. If you're using 1/2 cup of whey powder, add in about 17 ounces of your chosen ingredient. While you can make whey powder-based ice cream in an ice cream maker, making it by hand is not difficult or time-consuming and allows you to control the consistency of the finished product. Once you've thoroughly blended the ingredients, until the mixture is creamy and without lumps, put it in the freezer for 30 to 60 minutes. Stir the mixture again and return it to the freezer for another 30 to 60 minutes. Continue the mixing and freezing process until the whey powder ice cream is as set as you prefer. How Do I Drink Gold Standard Whey Protein?